DorsetSpeed is calling for an immediate suspension of mobile speed camera operations in Dorset following the death of a motorcyclist that appears to have been partly caused by one, until all investigations into this incident have been completed, and an independent and proper investigation into effectiveness of all speed cameras, taking into account such negative effects, has been fully completed. Dorset Way - the "new greed on green"? We don’t really know what’s happening with the greed on green camera now, the last we were told was that the detection threshold has been raised – so Dorset Road Unsafe are now telling us it’s ok to speed. Anyway, with probably every driver in and out of the area now familiar with this camera, slowing for it and speeding up again once they’ve gone past, Dorset Road Unsafe desperately needed something else to keep the money coming in. I’m getting increasing numbers of communications about people getting caught for speeding on the Dorset / Canford Way A3049, with it’s new and totally ridiculous 50 limit. Good plan, introduce a limit which quite clearly no one is going to follow on a perfectly safe fast road, with an excellent spot to put a camera van, and then use a van here instead of in busy residential / commercial areas terrorised by boy racers. I’ve not seen the van here but from memory the slip road provides an excellent hiding space. So if this is how DRS is going to keep the money coming in, vast numbers of drivers caught here will have to pay increasing amounts of attention looking for at least partially hidden enforcements EVERYWHERE they drive, looking backwards, sideways, etc instead of WHERE THEY ARE GOING. Brilliant. I’m not saying this is what drivers should do, but this is what is going to HAPPEN. This is one of the vast number of negative effects that everyone, except Dorset Road Unsafe, is aware of. This site does not exist in the mobile and laser camera site statistics, so they obviously didn’t bother with it while the limit was 70, not enough money to be made. Now it’s an unrealistic 50, I think they will be there regularly. Now of course we know that the council are incompetent in the matters of road safety, this has now been proven beyond all doubt by the Fleetsbridge fiasco. Common sense tells us once more that the right speed for this road is it’s original design speed and that the reduced limit and increased enforcement have all been done purely to preserve jobs and MAKE MONEY. Please let me know if you get a nip for driving on the Dorset / Canford Way. Dorset Speed was formed a few years ago in response to increasing concerns about road safety and the apparent inability of the “authorities” to do anything about it other than to turn it into a money gathering exercise. This became beyond all doubt when the Speed on Green was introduced in Poole in 2009. The junction is a clear and wide dual carriageway, particularly exiting the town, does not have much pedestrian activity, but has safe crossings. The 30 limit is ridiculous, you only have to look at the similar junction near PC World, which has a large number of popular stores on both sides of the main road and no pedestrian crossing, fewer pedestrian barriers, a 50 limit and no enforcement, to confirm that speed limits are not set intelligently and enforcements most likely to be installed to catch large numbers of safe motorists, while seeming to ignore the seriously incompetent and dangerous drivers who actually cause the carnage on our roads. Income from Driver Awareness courses in Dorset, available to Dorset Police and the authorities who fund Dorset Road Unsafe. They lied about this for as long as they could, telling us that they had no "financial motivations" to use enforcements to make money. They now tell us "Any income that arises as the result of an offence is used entirely to enhance Road Safety". If this is true, why do they go to such lengths to avoid telling us where the money goes? At the least, it also keeps them all in employment. They tell us "Only those who break the law pay anything". No. We all pay for misguided "road safety" policing, through council tax, increased insurance, hospital costs, road closures, and increased danger on the roads. And they are increasing the fee yet again - to £110, unless anyone knows better, still the most expensive course in the country. "East Dorset remains one of the healthiest places to live, with the lowest rates of deaths from heart disease and stroke, and cancer in the region. However, rates of road injuries and deaths are significantly higher than the England average at 74.6 per 100,000 population (64 deaths on average per year between 2006 and 2008)." 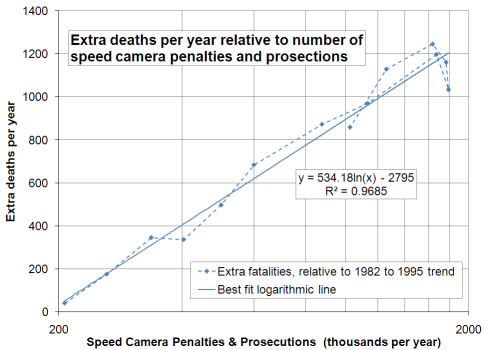 "This graph shows, with 98% correlation, the extra deaths related to speed camera penalties. It shows quite clearly how the extra deaths increase with the increased number of speed camera penalties, and how they similarly reduced as the penalties have been reduced. It does not necessarily follow that the penalties cause the extra deaths, but it shows how the obsession with enforcing speed compliance, at the expense of other more beneficial methods, has resulted in more than 10,000 deaths on our roads." Sensibly set speed limits? No way! 26 Jan 2014: How much more desperate can Dorset Police get to make money from safe driving? 22 June 2013: NHS scandle - I thought they were talking about road safety! 27 March 2013: NHS Whistleblowers gagging scandal – Road Safety next ? 10 March 2013: Now we can see why we have such stupid speed limits…. 8 Dec 2012: A decade of obsession with speed has reduced percentage of speed related road deaths by …. wait for it ….. 1% !!! 27 Feb 2012: Poole's parking enforcement car also fining vehicles not parked! 19 Feb 2012: Parking enforcement car for Poole? 17 Jan 2012: "Communications" with Adrian Walsh of "RoadSafe" in relation to Prince Michael of Kent award for Dorset Road "Safe". 6 Dec 2011: More wishful thinking about "No Excuse"
19 Nov 2011: Driver awareness courses - perverting the course of justice? 15 July 2011: Greed on green camera did make a £ million in a year! 27 May 2011: In the Echo: "No Excuse" makes no difference! 19 May 2011: "No Excuse" makes no difference! 11 May 2011: Outbreak of common sense at the DfT??? 16 Jan 2011: Dorset Road Safe – public confidence and trust at an all time low. 4 Dec 2010: £1m pa Dorset Road Safe staff includes £37k "Communications Manager"! 16 Nov 2010: Rocketing financial income from "driver awareness" courses in Dorset. 5 Oct 2010: "Cutting speed cameras will mean more accidents"
10 Sept 2010: Is this the end for static speed camera funding in Bournemouth? 5 Sept 2010: DRS (Dorset Road Safe, previously the DSCP) still completely unable to provide any evidence of "community concern"
22 August 2010: Good stuff, Dorset Road Safe! I saw your van in Upton today, but this time not pointing at traffic having just entered the 30 limit from the 60 mph Upton House direction, but pointing back at the ped crossing within the 30 limit, on a wet day, where the 30 limit would certainly have been dangerous to exceed. I do not know if this was in response to the BMW I mentioned recently going through the ped crossing full throttle at probably 60+, but this is a perfect example of how the public would like to see these camera vans being used, and I hope that if the same BMW came through again at speed, you caught him!caught him! 22 August 2010: There may be further delay before updates: My police complaint has resulted in an offer of a meeting with Adrian Whiting, Assistant Chief Constable of the Dorset Police, I'll be putting my efforts for the time being into getting the best possible outcome for this. 20 August 2010: Sorry about the break, I've been on holiday! There's plenty to catch up with, will try to get up to date in the next week. 6 August 2010: Is this the end for Dorset's speed cameras? 29 July 2010: FOI RESPONSES! 28 July 2010: End of fixed speed cameras - Dorset next?? 20 July 2010: Well done for complaint emails but PLEASE keep them going, here's a good one! 5 July 2010: GREED on green figures released - £108,000 a month from a single camera!!! 10 June 2010: Anger at "speed on green" at Holes Bay, Poole. The fine counts should be published shortly for the last 3 months of the last financial year - watch this space. This has only become available from FOI exemption following DorsetSpeed's complaint to the Information Commissioner - they wanted to keep it secret - perhaps we'll find out why. 31st March 2010. DorsetSpeed has obtained information concerning fine counts at the Speed on Green on Holes Bay, Poole, and succeeded in gaining much better visibility into DSCP activities in the future. .
11th Feb 2010. PROTEST AGAINST PROPOSED REDUCED SPEED LIMITS FOR POOLE. .
3rd Feb 2010. Action against really silly speed limits. The limit on the Wessex Way in Bournemouth has been reduced to 40. 50 was far to slow, but 40! Here is the proof that those with the important responsibility of setting speed limits really have not got a clue. I guess the DSCP will be rubbing their hands with glee, at the opportunity for setting up some speed traps here. Now they can send out fines to people doing less than 50 on what is almost a motorway! 31st Jan 2010. Complaints coming in about the "Speed on Green" at Holes Bay . I’ve received many complaints about the speed on green at Holes Bay, Poole. The 30 limit has no justification and no credibility (consider the busier 50 limit junction near PC World) and the decision to strictly and deviously enforce the limit at this junction, probably one of the safest places on the planet to do 30 (or 40 or 50) results in huge numbers of conscientious motorists receiving fines, to the point that the DSCP are trying to keep secret the fine count as it would obviously raise outrage, although I am trying to get this published. Any organization that attempts to hide it's results rather than present them as evidence of success obviously has little actual belief or integrity. One disappointing result of this is that the tasteless and irritating “it’s 30 for a reason” campaign that’s on local radio every 5 minutes is a complete waste of money like most of the other DSCP activities– the only reason that most people now consider speed limits are set is to give the “safety” partnerships opportunities to send out large numbers of fines. This is damaging as obviously, sensible limits intelligently and proportionately enforced would be a good thing and would be widely supported. The single minded determination to maximize fine counts of course means that they are completely ignoring the facts that those who want to speed dangerously can do as they please, and that there are a multitude of other driving problems that cause the completely unacceptable level of accidents we hear about almost every day. The resulting suffering of those involved in accidents and those around them which may not have occurred if the "safety" partnerships were actually working on safety, and the fall in respect and support of the general decent public for the police and the law is exasperating. I’m sorry, it is as bad as this. Most will just take this on the chin, pay the fine, then learn not to get caught speeding again rather than reduce their speed, this is obvious when you look at the way the majority of drivers now ignore more speed limits but slow for cameras - I'm not saying this is the way it should be, but the inevitable result of the current dismal policy. The fact that the DSCP have chosen to carry out the speed on green on the Holes Bay Road is proof that their motivations are thoroughly misguided and therefore that they are not fit for purpose. It would be so easy for the DSCP to do so much better, but while they are motivated only by cash, this won't happen. Please email me if you have any thoughts about this, or if you have been caught here. 18th Jan 2010. Moving in the right direction? It seems that in Dorset, fixed cameras are to be withdrawn, and the “no excuses” campaign is starting to put real police on the road looking for real problems. This is a major step forwards, very encouraging for the many like me who have been complaining bitterly for years about how road safety management has been totally corrupted by the obvious aim to simply raise as much cash as possible from traffic policing while ignoring the obvious simple dangerous problems that cause such misery. It will be interesting to see how the new approach works, it could work very well, as long as the motivation of those involved is to educate and improve safety, rather than to still issue the maximum possible number of fines, which will inevitably shift the attention away from the serious problems to the trivial ones. The Dorset “Sa£ety” camera partnership still carry out occasional, predictable, ineffective, mobile operations in the area. While some councils are starting to realise they can no longer cope with the cost and embarrassment of supporting and promoting the partnerships, Dorset seems committed to them. The DSCP are introducing mind-blowingly stupid operations like the Speed on green at Holes Bay (see below). Not surprisingly, driving standards continue to deteriorate, and numbers for those killed and seriously injured on the roads are increasing (see below). Respect and compliance of speed limits are reducing. Throughout the day and night, race tuned vehicles can be heard racing around at full throttle. On every short journey I see drivers who demonstrate a complete lack of awareness for all other road users around them, above and below the speed limit. Congestion is getting critical, the only signs of interest from the council seems to be “road surveys” carried out with staggering incompetence and with no chance of providing the dynamic continuous data which could so easily be transparently gathered with today’s technologies. Journey times, driver stress and fatigue increase, leading to more and more accidents and an escalating problem. Numbers of uninsured drivers, cloned vehicles, etc. are staggering. Despite all of these problems, all that is done is to attempt to dish out large numbers of speeding fines. This has little meaning even to insurance companies who no longer significantly load premiums for even multiple speeding convictions. Even the partnerships can’t be bothered to pursue large numbers of tickets. The majority of those actually being penalised are those who are the few remaining decent people who wouldn’t dream of challenging the “authorities” and with all paperwork completely in order, and have exceeded a limit by a tiny amount under completely reasonable circumstances, i.e the easy targets who aren’t causing a problem. Those who run the “sa£ety” partnerships and road management at the councils (and the public) must understand they are doing an extremely bad job and the deaths and injuries that would not be occurring if they were thinking about road safety, rather than whatever it is they are thinking about (pensions, job security, bonuses, nothing, ??) cannot be ignored. The DSCP has not answered a single one of my criticisms over the years – do they have any integrity or belief in what they are doing? I don’t think so. Often, the excuse given for not policing the roads properly is that it’s too expensive. Wake up! Look at the full picture – a death or road injury can cost a £million easily. Congestion (both normal and resulting from road accidents) costs businesses significantly. A dedicated, properly focussed road safety team could pay for itself several times over. Of course, it might mean redundancy for large number of civil “servants” pushing piles of NIPs around in circles and loss of face to those who have supported what has become, if you think about it, possibly one of the most mis-directed activities ever setup by the government. Below are some examples of speed camera operations, which clearly demonstrate the irrelevance of what is done compared to the real problems on the road, which become obvious when you observe what happens and apply some common sense. No wonder the roads are so bad. Where has the Dorset Safety Camera Partnership gone? I've not seen any of the mobile vans around for ages - and there certainly don't seem to be any new cameras going up. Has public disgust at these pointless and damaging organisations and their activities finally resulted in success? It's looking good! Next, we need some more proper policing of the roads to target the actual real problems (driving standards have become much worse while the total reliance on speed cameras has been in force), and some effort by the councils to properly review speed limits (upwards in many cases) and promote efficient use of the roads. DSCP mobile vans have been much less frequently seen around Poole in the last few months, perhaps a result of the widespread realisation that this is all about collecting cash and the reducing respect for these activities. Sadly, seen again today at one of their most profitable positions, possibly cashing in on summer visitors unaware of this particular trap. "Just as with fines for over-filled wheelie bins, the Government has a perverse preference for stealth taxes that punish and criminalise ordinarily law-abiding citizens, rather than being open and collecting revenue in a simple and transparent manner. It is worrying, too, that prosecutions for dangerous driving and for driving while drunk or on drugs have fallen, surely two areas where the Government should really be focussing." 16th Nov 2007: The Dorset "Safety" camera partnership doing what they do best: clocking up the cash where a limit has been set totally unrealistically low for the road type. A road accident resulting in people being killed or seriously injured must be one of the worst things that can happen. This is exactly why road policy and enforcement should treat safety as the most critical aim, and secondarily, to promote efficient traffic flow. It should ensure that the maximum effort should be targeted at the most important problems, and not at operations which are likely to target safe driving and be interpreted as only a way to make easy money. It should be the responsibility of those empowered with this duty, to do the best job they can possibly do to achieve this. Sadly, it is the belief of many, that road safety methods and enforcements at the moment are badly misguided. While large numbers of safe motorists are penalised for driving at a speed which absolutely no one would consider is dangerous, the problem speeders who are practiced at avoiding detection, and the large proportion of other drivers who demonstrate many of the multitude of other driving problems, continue with little likelihood of detection and education or penalty, and the daily list of closed roads due to accidents mentioned on local radio stations seems to continue growing. Most of us are familiar with the idea of government and councils getting things badly wrong, but this is much more serious, and as individuals, we can do nothing about it. It is the aim of this site, to focus public attention on this issue, and hopefully eventually to collectively challenge, and maybe even change, the way in which this critical activity is carried out. Speed limits and enforcements are a vital part of road safety, but must be set realistically, applied proportionately, with other types of enforcement, and in a way which generates general respect and support, and therefore, ultimately, improving safety and efficiency. The situation is getting worse, and will continue to deteriorate, unless something is done. To do nothing is no longer an option. It is truly extraordinary and very sad that the "authorities" seem to be attempting to provoke outrage by alienating large numbers of the public against road safety efforts, while doing little relevant to improving road safety and efficiency. We now need a system which achieves real accident rate reductions combined with traffic flow improvements, rather than one which is simply very good at generating a huge quantity of motoring convictions. The likely difference in accident rates, serious accidents, and road deaths, resulting from what is being done now, and what should be being done, doesn't bear thinking about. You can now make a difference, by supporting the efforts of DorsetSpeed.